Since we began in 1994, our slogan has been “We get your metal into shape”. Over the years, we have developed from a pure sheet metal producer into a full supplier. We accompany your product at request from development to prototyping to series production. Our goal is to satisfy your individual wishes and to maintain consistently high quality. We offer specific and creative advice on how to put your ideas into action. We take your thoughts, models, hand sketches, drawings or computer data and put them into development, design and finally implementation. We look forward to your new ideas. We will meet your challenges. 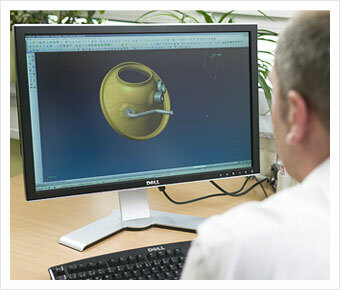 Design and programming with powerful CAD/CAM systems. Production and delivery of single parts for further processing by the customer, to ready-assembled components, to customer-ready products, if necessary with surface finishing and inscription or labelling.